Often, we say things like, ‘ the so and so brand is targeting the casual consumer instead of the serious runner.’ This usually happens when the shoe being reviewed is from one of the big two brands – adidas and Nike. But there’s a very good reason why shoe giants target the casual sportswear market. This segment is huge, dwarfing other performance categories such as running footwear. Without lifestyle products in its portfolio, brands like adidas or Nike would never be the giants they are today. This statement isn’t an opinion – it is a fact. Adidas doesn’t report its revenues by category, but Nike does. A third of its entire revenue (see page 75) came from ‘Sportswear’, which is Nike-speak for casual athleisure. Nike running is only half the size of the Sportswear business. And this is when running also includes a lot of products which, for all practical purposes, should be labeled as Sportswear. So what would happen if a brand did nothing else but design the entire product line around performance running (and walking) in mind? Adopting the said strategy would result in a brand such as Brooks or Saucony. Brooks is a small big brand. Small, because it’s not even a billion dollars in annual revenue. It’s big, because Berkshire Hathaway’s 2017 revenue was a quarter of a trillion dollars. Berkshire also happens to own the Brooks brand. One has to give Brooks credit for staying true to its running-only focus, despite having Berkshire’s financial muscle-power to help it foray into other categories whenever it chooses. And kudos to Berkshire for letting Brooks chart its own destiny instead of trying to extract quick returns on their investment. Because of its product strategy, Brooks does an excellent job of product differentiation and tiering. Another area where Brooks scores are the quality of materials used on its running shoes. Till September 2017, Brooks did not have any shoe priced below $100. This gave Brooks freedom to use a premium material package regardless of the product’s place in the pricing hierarchy. But, the shoe brand from Seattle broke its unwritten $100 MSRP rule in 2017 when they introduced the $85 Anthem – a Pure series inspired trainer. The Anthem 2 was released in 2018. The Brooks assortment is fairly edited to begin with. Runners are familiar with some of the long-continuing models which represent their respective categories. The Glycerin is the plush neutral trainer with the lower-priced Ghost below it. Among others, the ‘Pure’ series (Pureflow and Cadence) is a remnant from the heyday of minimalist/barefoot running. 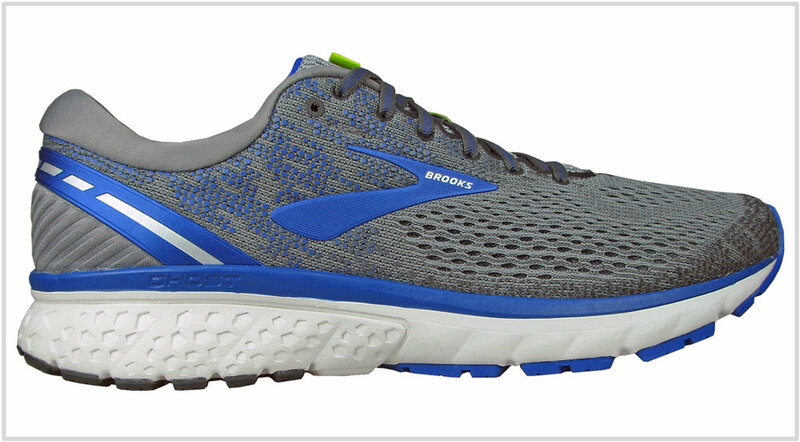 The Brooks Launch 6 is stand-alone shoe which offers a firm yet cushioned ride experience for tempo runs. The Revel 2 is similar to the Launch except for its slightly higher weight, an additional 2 mm midsole offset, and a knit upper. Brooks has plenty of supportive trainers, both in a traditional (medially posted) and a neutral guise. The Dyad 10 and the Transcend 6 are marketed as support shoes but they lack a medial post. On the other hand, the Beast represents the traditional stability category. Can the brand’s product assortment be improved? Absolutely. For example, Brooks lacks a credible lightweight trainer and a road racer. Brands like adidas, Asics, and New Balance have addressed this need well with the adizero Boston, Dynaflyte/DS Trainer, and the Zante Pursuit. In the past, Brooks had the excellent combination of the lightweight T7 racer and the ST5 trainer. Today, you have the Hyperion and the Asteria, but this category still feels under-represented. Besides, these models haven’t been updated in a very long time. Nonetheless, Brooks has made excellent progress in other categories over the past 18 months. There’s a slew of new models based on two new cushioning platforms. The Levitate’s ‘DNA AMP’ is based on a sealed Polyurethane foam design whereas the ‘DNA Loft’ appears to be a synthetic rubber blend. The DNA AMP has its failings, though. The material is based on foamed Polyurethane. This means that over time the PU foam breaks down – we’ve comes across instances of the DNA AMP midsole splitting into half. Even our dissected midsole discolored to a pale yellow within a few months. The DNA AMP is also stiff and heavy. On the other hand, the ‘DNA Loft’ foam is all that the AMP isn’t. The Glycerin 17 and Ghost 11 use the DNA Loft foam, and so does the Adrenaline 19 and the Transcend. The cushioning quality is deep, yet firm and weighs less than the AMP. The Loft is certainly an upgrade over the existing DNA foam. Though Brooks is abandoning layered overlays in favor of knit uppers, it maintains a fine balance between minimalism and cosmetic details. The Glycerin and Ghost combine a knit upper with visual enhancements. Most of the details are functional too. The Glycerin’s laminated midfoot adds visual depth as well as structural support. On the Ghost, the side logos help streamline the upper shape. In short, we like what Brooks is doing. There are some product gaps, but the brand has been consistent with the pace of innovation and the usage of premium materials. Here’s a curated list of Brooks running shoes which best represents their category. Brooks’s advertising would have you believe that the Glycerin 17’s full-length DNA Loft midsole delivers a pillowy-soft ride. That’s not the case. The Glycerin has seldom been a very soft running shoe, and the 17 is cut of the same cloth. That said, there is no disputing the fact that the Glycerin offers high-quality cushioning, the kind which sees you through marathon distances. The 17 is also softer than the 16 due to the updated Ortholite insole. 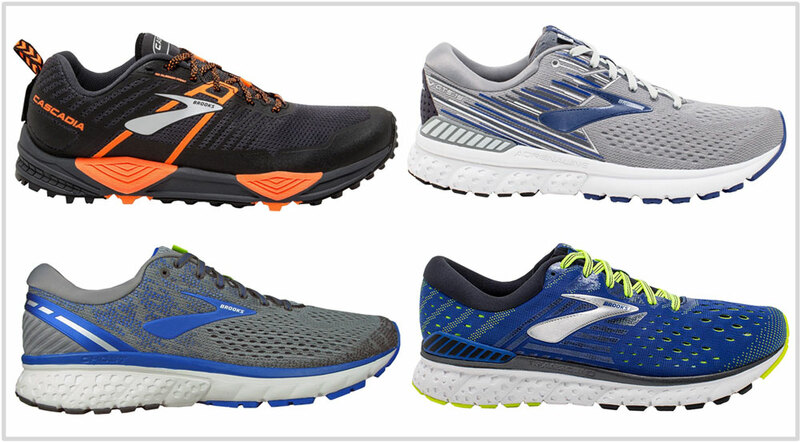 The Glycerin 17 follows the same behavior as nearly every other shoe in Brooks’s assortment. It is smooth and supportive without the nervous sideways sink of soft running shoes. It is truly a neutral shoe, both in word and spirit. This isn’t a shoe to be rushed. There’s over 11-ounces of mesh and foam to be carried around, which means that the Glycerin isn’t the best shoe to go logging speed miles in. You’ll find the upper very comfortable, albeit form-fitting and warm. Brooks has tapped into its premium material library for this one. The inner sleeve turns the insides smooth; the heel collar is foam padded with a soft hand-feel. Forefoot strikers will be surprised to discover that the Ghost is softer under the forefoot than the Glycerin. Unlike the more expensive model, the Ghost 11 mostly uses an EVA foam blend which is softer than the DNA Loft. Only the outer heel crash pad is made of the firmer LOFT foam. The Ghost is a great alternative to the Glycerin if you’re looking for a lighter daily neutral trainer which costs less. While the upper doesn’t have an inner sleeve, the interiors feel plush and smooth. The amount of space is just right, and the optional widths come to your rescue if you are stuck in a tight spot. A waterproof and winterized Ghost 11 GTX (Gore-Tex) version is also available for a $30 upcharge over the regular Ghost. Don’t think of this shoe as a slightly lighter Ghost; instead, use the Launch 6’s firm ride manners to speed up your pace while keeping your foot protected over longer distances. Its entry-level price isn’t accompanied by any cost-cutting. The Launch uses premium materials, and the result is a smooth-fitting upper and a comfortable ride. The Beast series is updated biennially. This model has changed significantly over the years; the 2018 version is perhaps its most drastic evolution yet. A telling sign is a huge improvement in forefoot space. Unlike the ’14 and ’16 models, the Brooks Beast ’18 features a spacious interior. And Brooks also retails two additional widths. The Beast 18 isn’t the stability gold-standard the Beast 14 was, but it is still an extremely stable shoe. The removable insole resembles an aftermarket orthoses and provides a best-in-class cushioning for a stock insole. Stability is delivered by the multi-density midsole which has a humongous medial post along with a plastic half-shank. The ultra-wide outsole footprint also creates a supportive foundation for the foot to rest on. If the Beast 18 is too much of a shoe for your liking, then the less expensive Addiction 13 bridges the gap between the Beast and the Adrenaline. We’ve been saying for a long time that traditional stability shoes with a medial-post are functionally unnecessary. Huge advancements in midsole foams have made most ‘neutral’ shoes inherently supportive. 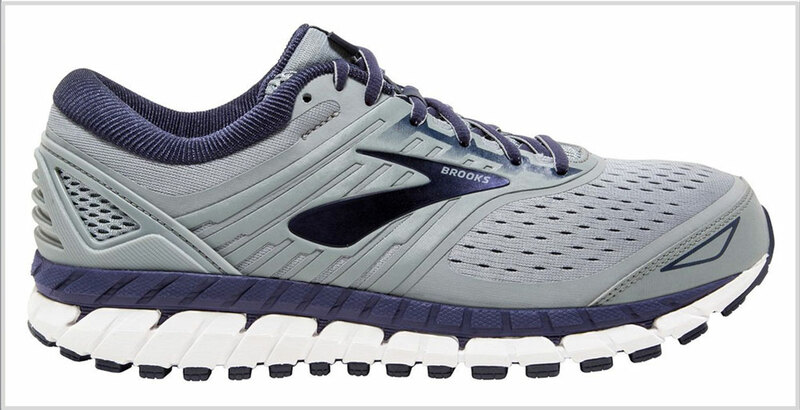 Brooks was the first brand to step outside the traditional stability shoe boundaries when it introduced the Transcend. And guess what – the Adrenaline GTS 19 marks the beginning of a new chapter by adopting Transcend’s ‘Guide rails’. The Adrenaline no longer has a medial-post and relies completely on the side midsole rails. So the new model is more ‘supportive-neutral’ than conventional stability. The lower midsole is similar to the Ghost 11’s design but a mite firmer. 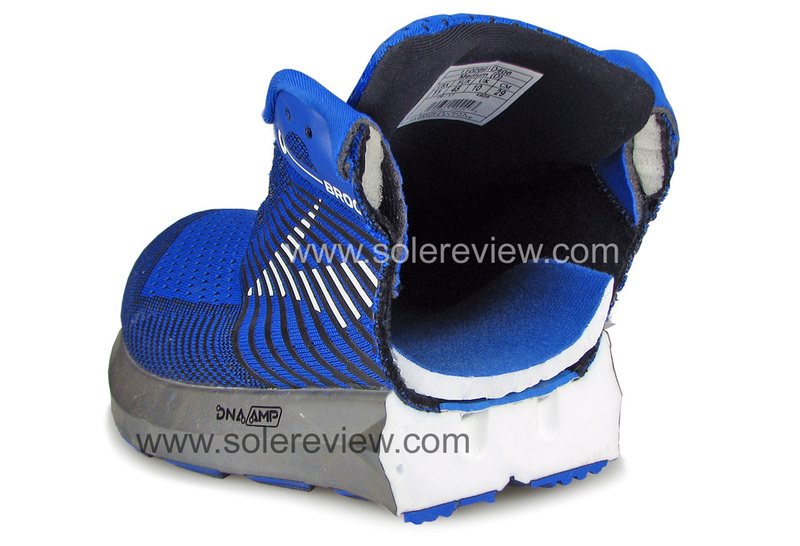 A DNA Loft crash pad is integrated into an EVA-based midsole. The upper is comfortable – as it always has been. The insides are smooth and fit securely with a just-right amount of space. If you are looking for a shoe with a medial-post, then we suggest the Brooks Defyance 10 or the previous generation Adrenaline 18. 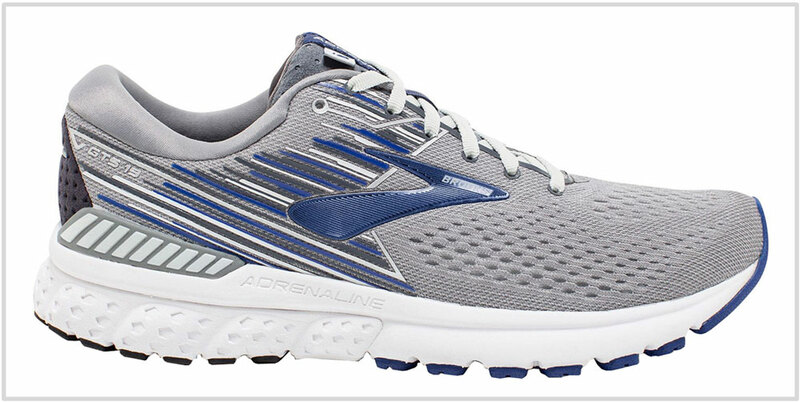 It seems as if the Brooks Transcend went on a low-fat diet right after its initial release. Successive versions kept losing midsole bulk and upper trims, so here we are; the Transcend 6 is barely recognizable. Its minimal Glycerin-like upper and a toned-down Guide Rail design have little in common with the 2014 model. Still. The Transcend is very good at what it does. Which is being a very supportive shoe with all the cushioning you’ll ever need. Not only are the Guide Rails effective in what they do, but runners will also experience a marked sensation of under-arch support. The Guide Rails add stability to what is an already wide and supportive midsole footprint. The Transcend 6 gets an Ortholite insole and an extra 2 mm of heel stack for a softer ride. Though the Transcend lacks optional widths, the upper now has enough room based on a standard ‘D’ width benchmark. In 2019, the Transcend 6 feels right at home. Traditional motion-control shoes are soon going to be a thing of the past. And the Transcend, with its elevated Guide Rails, is the North Star for the supportive-neutral trend. The Beast ’18 and Addiction ’13 must be feeling lonely. Because those are only two in Brooks’s line with a proper medial post – a harder foam wedge seen on stability shoes. After the Adrenaline, it’s the turn of the Ravenna to bid adieu to the medial post. It makes sense, for the Ravenna has always been a baby Adrenaline of sorts – a toned down version with lower usage of stability features. Till the last year, the Ravenna 9 had a medial prop. The Ravenna 10 has ‘guide rails’ on top. These are raised barriers cupping either side of the midsole, and were first used on the Transcend 1. It trickled down to the Adrenaline GTS 19 and now the Ravenna. By functional definition, the Ravenna is now a neutral shoe with more midsole support. Speaking of which, there’s plenty of midsole too – that makes it an ideal daily trainer for runners who’re looking for a supportive, smooth, and cushioned ride. The comfortable upper gets an inner sleeve and a visual scheme borrowed from the Launch 6. All in all, the Ravenna 10 offers plenty of value for its $110 retail price. It comes in a wide (2E) too. There aren’t many lightweight trainers/racers in Brooks’s current line-up; the other one is the Asteria with its small medial posting. To be honest, the tight-fitting Hyperion falls short of the standards set by the ST5 and the T7. So within Brooks, is this the best lightweight trainer/racer at the moment? Yes. But your needs are better served by shoes from other brands. Buy the New Balance 1400V6 if you do not have to stick to Brooks. The Cascade is a well-built trail shoe with superior grip and a versatile character. The heavy-duty mesh and rubber overlays on the gusseted upper keep the debris out. The upper is also reinforced with a synthetic mudguard and toe-box which prevents slush from sticking to the upper edge. The forefoot has a rock plate between the lugged outsole and the midfoot. The foam midsole and the stability wedges deliver cushioning and support for the longer trail miles. And if you plan to wear gaiters with the shoe, there’s a velcro loop over the heel which keeps it locked in place. A waterproof Cascadia 13 GTX (Gore-Tex) is available for an extra $30.